This is full color photo print of a hand-colored tintype photograph. Featuring Civil War Unidentified soldier in Union cavalry uniform with banjo, sword, and pipe (between 1861 and 1865). This is a high-resolution approx. 5" x 7" vintage image. Hand oil tinted and photo processed onto Glossy Photo Paper. Deadline for Overnight and 2Day Air is 4pm Eastern. 0 - 1.00 lbs. 1.01 - 2.00 lbs. 2.01 - 3.00 lbs. 3.01 - 4.00 lbs. Doing that is against U. 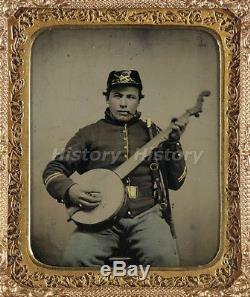 The item "CIVIL WAR PHOTOGRAPH Unidentified soldier in Union cavalry uniform with banjo" is in sale since Tuesday, March 31, 2015. This item is in the category "Collectibles\Photographic Images\Vintage & Antique (Pre-1940)\Tintypes". The seller is "memomine-com" and is located in San Jose, California.